Peter Laird's TMNT blog: "The Marvel Method"
This post isn't about Teenage Mutant Ninja Turtles, but it is about comics, so I figured "Close enough!". Maybe I'll post it on my other blog, too. 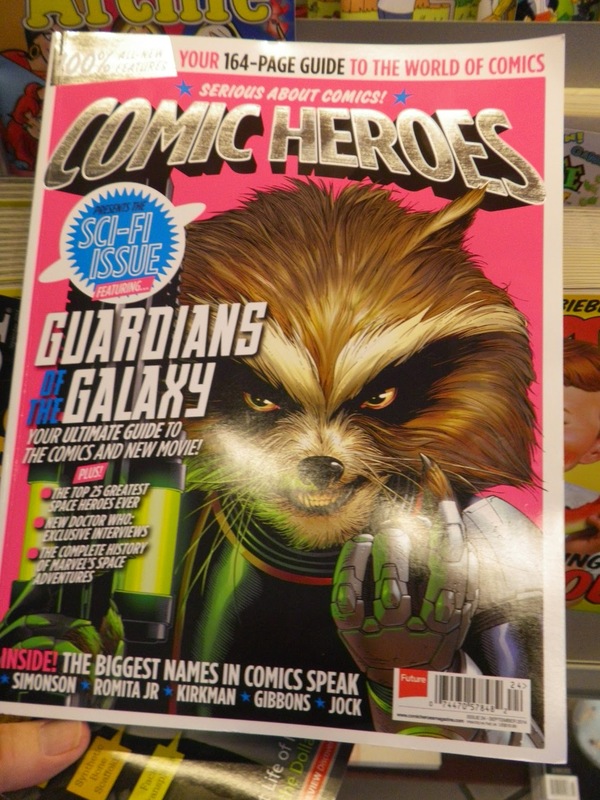 I was in Barnes and Noble last week doing my weekly "check out the new magazines" thing, when my eye fell on the cover of a new issue of "Comic Heroes" magazine. Nothing about the contents, at least from the cover, immediately appealed to me, so I went to the table of contents, where I saw that inside was a story about the famous "Marvel Method" of creating comics. I was skimming the article when I noticed a familiar illustration -- a self-portrait by Jack Kirby (inked, I think, by Vince Colletta), which I remember seeing print in one of the books DC published during Kirby's sadly brief tenure there when he was doing his amazing "Fourth World" comics. You can even see various references to his DC work in the illustration (note, for example, the little head shot of Orion from Kirby's "New Gods" comic book on the page he is depicted working on). 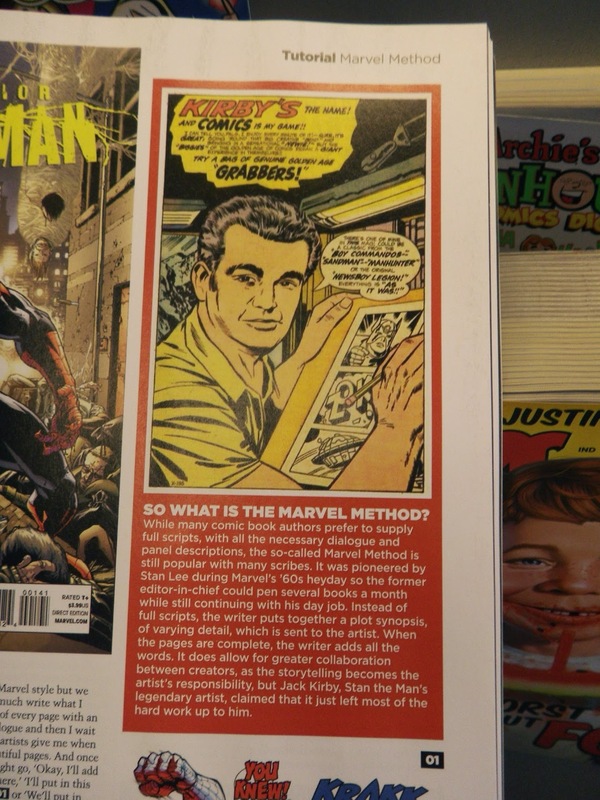 Of course, this immediately leads to an obvious question: Why in the world is an illustration from Kirby's time at DC Comics being used for an article about the "Marvel Method"? What was going through the editor's and/or art director's mind/s when putting this page together? Could one not find, in all the thousands of pages of art Kirby produced for Marvel, something which would have worked here? Not only that, but as I understand it, the way Kirby worked on his books at DC during that time was not at all in the "Marvel Method"... so the choice of this illustration is even less coherent. Write a letter to the editor! They need to know people notice these things. Whenever possible, try to influence the pervasive "dumbing down." They can get this right. Your attention to detail never ceases to amaze me. It's on the level of being a super power. Admission to the X-Mansion granted. I remember the things you found on the book about the history of the TMNT. And then there is this. If I ever had to choose an editor for anything (not that I work on publishing at all, but even so), you will be at the top of my list. I would then know things would go to print as free of contradictions or incoherency as possible. I was going to send them a link to this blog post but after going to their site I discovered that this issue is their last one so I didn't really see the point in it anymore. And really PL, your knowledge of comic history is pretty inspiring! My guess is they Googled "Jack Kirby portrait" and used the very first image that came up (which is the one in the illustration). Those kind of magazines are cash grabs, nothing more, and generally they do not spend any time or effort on research. Wasn't Kirby writing a lot of his own stuff at DC? That's not the Marvel Method at all! Last year I tried a stint where I decided to re-acquaint myself with my second favourite mutants of the 80s. Of course, they're spread out now, so I was buying eight (I believe) X-Men titles but I was still missing out. They were constantly referencing other comics and crossovers, watering down the people I wanted to see with what felt like they should be background characters put in the spotlight. I think I lasted six or eight months before quitting, and giving them to my niece (who is in love with Hugh Jackman...I mean...Wolverine). They would actually paste over a face, at least at the beginning. I think later on they would re-ink the Superman faces so they matched the "style guide" since Kirby's Superman looked nothing like the standard Curt Swan - Murphy Anderson Supes. Any thought on the latest settlement between Marvel and the Kirby estate?